IRISH UNIVERSITIES HAVE failed to make the top 200 in the Times Higher Education World University rankings. The latest league table, published this evening, shows that University College Dublin (UCD) has dropped down into the 201-250 band since last year. UCD now appears alongside the Royal College of Surgeons in Ireland and National University of Ireland Galway (NUIG). Both these universities have progressed since last year, gaining ground from the 251-300 band. President of NUI Galway, Dr Jim Browne said the success in recent weeks of its advancement in global university rankings reflects the “ambition, hard work and creativity of our staff and students”. We have been doing the best we can with limited funding to support activities that are having a real impact globally, by working closely with industry and focusing on collaboration while also advancing the international reach of our university. One notable absence from the list this year is Trinity College Dublin. The university has been temporarily removed from the rankings while a review of its data is undertaken. Trinity College Dublin contacted our data team to point out an error in the data they submitted during the World University Rankings data gathering process earlier this year, and in the previous cycle in 2015.It appears to have been a simple human error and our initial assessment is that it would have a material impact on Trinity’s position in our rankings, giving them a lower ranking than would otherwise be the case. 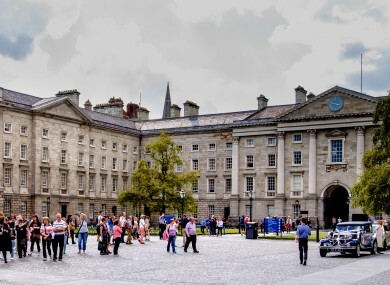 A spokesperson for Trinity College told TheJournal.ie said it was working closely with Times Higher Education to resolve the issue which is a result of “underestimating research income”. This is bad news for Ireland; the country’s best universities are struggling in the most comprehensive and the most exacting of all the global rankings. While the root of the problem is the increased competition among the world’s elite universities, particularly those in Asia, it seems clear that the major funding cuts endured by Ireland’s universities are causing problems. However, he said the gains by both NUIG and The Royal College of Surgeons are to be celebrated. “Ireland is one of the lowest investors in higher education among all OECD countries and you simply cannot sustain world-class universities on the cheap,” said Baty. Brian Hayes MEP said the loss of research funding because of Brexit is a factor in the any decline of Irish universities. Speaking ahead of the results, Hayes said if Irish universities fall outside the elite top 200, “our reputation as a global innovation and research centre would take a hammer blow”. A good ranking for Irish universities is essential to attract grants, donations and the best and brightest researchers. Meanwhile, Fianna Fáil said the fall in rankings is a result of underfunding third level institutions over the last five years. “Our universities and their staff have been doing a good job in difficult circumstances and still provide a very high quality of education and research. However due to the legacy of exchequer under-funding since 2012, they simply do not have enough resources to compete on the same terms with their peers,” said Fianna Fáil education spokesperson Thomas Byrne. “Across higher education, core expenditure for each student is down by 22% since 2011. This has fed directly into the decline in rankings amongst Irish universities,” he said. This year is the first time the US has lost out on the top spot in the 13-year history of the rankings. The University of Oxford in the UK has become the world’s top university. The California Institute of Technology takes second place, followed by Stanford University, the University of Cambridge and Massachusetts Institute of Technology (MIT). Email “Irish universities fail to make the top 200 in global rankings”. Feedback on “Irish universities fail to make the top 200 in global rankings”.